Welcome to the Flight Deck for September! 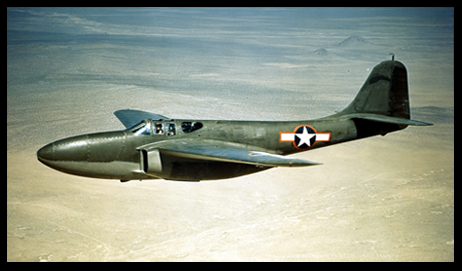 Bell produced America’s first operational Jet Fighter, the Bell “P -59” Airacobra. It was on the drawing board in early 1942 and it first took flight in October of that year. However, it never saw service in the war years. There was a lot to learn about Jet Engines, and American Authorities were in a more patient frame of mind than the Germans regarding Military Jet Aircraft. It wasn’t until August of 1945 before production produced the P-59A & P-59B versions with only 66 planes produced, however they never saw combat. They served in the 412th Flighter Group of the 4th Air Force at Muroc AFB. By 1950, none were in the air. But the P-59, though not glamorous, provided Air Force and Navy crews the needed experience in working with Jet Aircraft. The P-59 also provided the ground work for new Jet designs and performance levels. As a result, the P-59 Jet Fighter paved the way for the Lockheed P-80 Shooting Star. A bold new future was born in American Military Aviation. September 2nd was declared V-J Day, Victory over Japan Day, to end World War II. President Harry Truman declared the Victory Day commemorating the formal Japanese surrender aboard the USS Missouri in Tokyo Bay. The original “Rocky”, Rocky Marciano was born in September of 1923. The Brockton, Massachusetts, future heavy weighty champ was born Rocco Francis Marchegiano. The Rock fought famous Jersey Joe Walcott, knocking him out to win the Heavyweight Title on September 23, 1952. He retired as the only Undefeated Heavyweight Champion. He died in 1969 in a plane crash. The Julian Calendar was finally dumped by the British. The Brits went to the Gregorian Calendar, which caused rioting by many folks as the switch required an adjustment featuring “missing days”. The Big Jump went from Wednesday, September 2nd to Thursday, September 14th, a loss of 11 days. The rioters demanded the missing days back. The American Revolutionary War against Great Britain was formally ended with the signing by John Adams, Ben Franklin and John Jay with the Treaty of Paris. The United States was formally recognized in the family of nations. The Marquis de Lafayette was born in Chavaniac, France. He came to America as a 19yr. old, to serve under General Washington in the American Continental Army in 1777. He paid for the voyage to America himself, presented himself to Washington with no experience - volunteering his willingness to serve and to learn how to be a good officer. The Marquis learned fast and very well, given command of troops. He was instrumental leading American soldiers in the Battle of Monmouth and helped defeat General Cornwallis in Yorktown. The Battle of Britain starts. After the fall of France to the Nazi’s, the German’s bomb England, targeting the shipping yards of the Thames River. But the air raids turn massive, targeting London, Southampton, Bristol, Liverpool, and Manchester and other cities. The United States Army Air Corp is officially established as the United States Air Force, a separate military service by Congress. Autumn begins in the Northern Hemisphere. Spring begins in the Southern Hemisphere. American Legend Johnny Appleseed is born in Leominster, Massachusetts (known as John Chapman). With travels through the upper midwestern United States, John plants Orchards of Apples. For 40 years, he is known in Ohio, Indiana, and Illinois as Johnny Appleseed and Native Americans call him the “great medicine man”. The United States Army, with a grand total of only 1,000 Men and Officers, is formally created by the U.S. Congress. Americans are saddened and hurt over the news of the Death of Actor James Dean, who died in a car crash. Dean was only 24. Though only making three major films, his acting style was influential, even among his peers. American Politics is forever changed with the first ever televised presidential debate between John F. Kennedy and Richard M. Nixon. It was indeed a “first” but with mixed public results. Those who watch on TV, said Kennedy won the Debate. Those who Listened to the Debate on Radio, said Nixon clearly won the Debate. In the final analysis, Kennedy listened to the TV Experts and allowed make-up to be used on this face. Nixon declined the use of make-up, reveling a somewhat haggard look and deeply shadowed day-old face stubble. Kennedy won the election in November. Battle of Fort Henry in Baltimore, Maryland. Called the War of 1812, the British Navy attacked and bombards the Fort. A ship-born British prisoner, Francis Scott Key, kept aboard one of their ships, watches the battle and writes notes on what he sees. At dawn, the American’s huge Flag is still flying proudly over the battlements. Key writes a stirring poem from those notes, whose verses become the U.S. National Anthem in 1931. American Mystique, your headquarters for premium Leather Bomber Jackets and other fine jackets & coats.